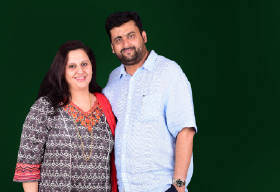 Bangalore Culinary Academy was envisioned by Rajesh and Sheraz Nair as an institution offering advanced International culinary and hospitality education in India at the most affordable and lowest prices in all of Asia. Academy as the name suggests is an institute of higher learning and that is what BCA focuses on. Ensuring that students are industry ready and well equipped to handle industry requirements by the time they pass out with their International Diplomas in hand. Sheraz and Rajesh Nair the promoters of the Bangalore Culinary Academy started their journey in the hospitality world over 20years back. Graduating with BHM degrees in 1997 both Sheraz and Rajesh started their careers at leading hotel chains in India. Rajesh moved in to work with the kitchens at top properties of the CGH earth group while Sheraz was recruited under the management program of the Taj group of Hotels. Over the years they moved onto bigger challenges and opportunities but destiny has a funny way to lead you to your calling, and that is when 20 years after the beginning of their journey they decided on starting their own educational institute to feed to the industry professionally, trained and poised students. What started off as a Culinary Institute slowly evolved into an institute offering Hospitality and Culinary Training increasing the course offerings to International Diplomas in Hotel Management. The industry by its nature is fast paced and vibrant and needs students who can take on responsibility and pressure from the day they join. Hoteliers don't want to spend month training and grooming fresh recruits, they want ready to work professionals. What one learns in college is very different from what one experiences in the industry. Students unless nurtured in the right direction are unable to take on the stresses of a hustling hospitality industry leading to early attrition rates. Courses at BCA offer to students the mechanism to deal with every day, real life work situations for them to be able to succeed in the industry. Choose a job you love and you will never have to work a day in your life. This is particularly true for those working in the hospitality industry. One, need not be academically inclined to be able to pursue a course in Hotel Management. However, passion for the job and an attitude to serve is of paramount importance. The jobs in the hospitality market are highly skill based and require more hands on training rather than only knowledge from books. Courses at BCA have been specially curated to ensure maximum student participation and hands on training along with the theory on why and how things work. Not only does the academy simulate and emulate live hotel situations in class but also grooms students to dress and behave for the roles they choose to take on once recruited in the industry. Ensuring that students are the right fit for the roles they undertake also increases their employability and ensures that they stick onto their jobs making BCA students a popular recruitment choice. Started with 11 students, BCA has already trained over 175 students in a span of two years. At present, the institute has around 70 students going through the intensive industry-oriented training at the campus. "We accommodate only 16 students in a batch. The small classroom size allows us to give individual attention to the students and groom them in a fast-track mode," says Sheraz who handles the academic activities of the institution while Rajesh takes care of the administrative aspects. The customized courses of BCA cover everything from basic to advanced levels of food production, getting the learner ready to serve up a multi course, restaurant style meal in any star hotel. "We have developed a comprehensive curriculum in association with international accreditation bodies. This will help the learners to garner the most advanced knowledge in hospitality, supported by international diplomas valid worldwide," adds Sheraz. In its well-equipped and completely modern training kitchens, the student can practice using industry standard equipment that they will use in any reputed restaurant kitchen. The academy has a strong faculty pool of professionals who are experts in their field of work and have the necessary qualifications and experience, some of them with over 15 years of experience and with train the trainer credentials. Impressively, the courses offered at BCA are affordable comparing to the similar programs available across the world. The academy offers International Diplomas in Culinary Art, Patisserie Art and in Hotel Management. There are options of pursuing two diplomas simultaneously saving time and money for students. This not only has attracted students around the country to BCA, but also the aspirants beyond the boarder. "We have students from Middle-East, Bangladesh, Nepal, Canada, Germany and US. They understand the value of our courses and join here immediately considering the quality and cost-effectiveness," says Rajesh. Sheraz says, "The international diploma at BCA gives you the unmatched advantage to be considered on par with a degree program and to be able to directly pursue your Master's programs at universities abroad." The academy has collaborated with Manipal City and Guilds(Global), and OTHM, both leading certification bodies from the UK, to offer the academic certifications. In addition to that, interested candidates can progress to complete their last semester at IMI Switzerland and earn themselves a Bachelor of Arts with Honours in International Hotel and Tourism Management degree from IMI and MMU (Manchester Metropolitan University, UK) simultaneously. IMI Switzerland also offers students from BCA guaranteed scholarships and extremely well paid internships for students of BCA.